To start, we need the SQL editor. Click somewhere in the tree under the system so that the SQL button marked below becomes enabled. Press the button to bring up the SQL console. As always, the blank console opens up. Note: Always remember that refers to the table name prefixed with the schema name as well as there can be tables of the same name in different schemas. Repeat this statement as many times as the number of rows you wish to add. 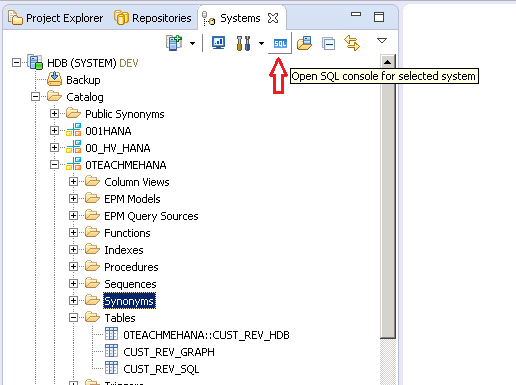 As seen below, I am adding data to the CUST_REV_SQL table which is in the 0TEACHMEHANA schema. System object names like schema names, table names and field names should be wrapped in double quotes “ ” whereas as you can see below, data values that have character data types inserted MUST always be wrapped in single quotes ‘ ’ whereas number do not require any quotes at all. As seen from the log below, there are no errors. This means that the data was inserted successfully. To confirm, right click on the table and click on data preview. The raw data tab below confirms that the data is now present in the table. 2. Linking a CSV file to a HDBTable using HDBTI Configuration file (Recommended method) which is our next tutorial as well. Help this website grow by sharing this document on social media by using the icons below. Tagged hana, hana sql, hana studio, INSERT, insert into table, sap hana studio, sap hana training, sap hana tutorial, sap tutorial, select insert into, sql, sql for hana, sql insert, SQL TRANING. Actually u have created a table with name of CUST_REV_HDB, so how we can insert values to that table.? 1. How to find respective CSV and HDBTI files of HDB table. In above tutorial since you created in same package its easy to find, there might be scenarios where CSV and HDBTI Files might be in different packages. 2. 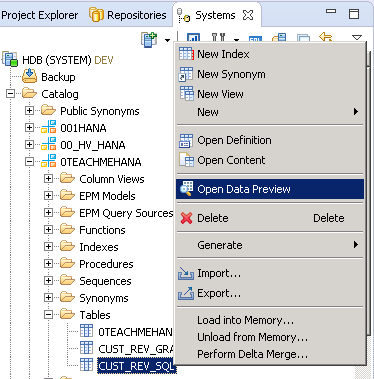 How to find whether HDB table data is getting data via CSV file or via SQL Script insert statement.